This was my last available day to do some walking on the South West Coast Path for a while. Waking up and looking out of the tent, again there was nothing to see except the mist so I had some breakfast before packing the tent up and sticking it into the roof box on the car to dry out once I get home. Left the car at the camp site and walked down to Polperro where it was all very quiet before the visitors arrive. Again, the mist was only at higher level so it wasn’t too miserable looking down at the harbour where the tide was on it’s way in. The path continues along the east side of the harbour passing some very pretty cottages and rises steeply for a short distance onto the cliffs. There is a war memorial on the headland but the coast path currently misses this due to a diversion because of cliff erosion. Instead, the path crosses farmland before joining a single track road down to Talland Bay. Here, there is a nice little cafe where I stopped for a coffee looked at the delicious looking cakes opting for a piece of Tiffin although I was disappointed with it. Tiffin normally has chocolate, biscuit and raisins in but this was a different recipe and was much too sweet and seemed to be a caramel icing on it. Another couple had toasted tea cakes which I missed on the menu board and would have enjoyed. Anyway, once I finished my drink, I carried on along the low cliffs where remainder of the walk was quite easy going and it wasn’t long before ‘Looe Island’ also known as ‘St. George’s Island’ was in view . 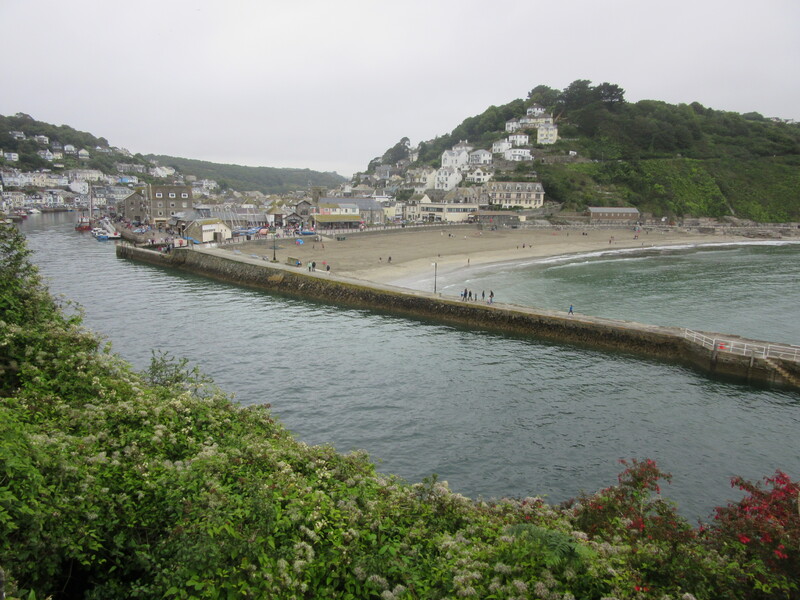 I was soon in the suburban area at Hannafore which is the western end of Looe where the road and pavement for part follow along to the tidal river at East and West Looe. Here, there are plenty of shops, boat trips, bus service and railway station. I sat and waited for the bus back to Polperro while chatting a an elderly scotsman who moved here around fifty years ago. He lived a tough sea fishing life in Scotland with his father then decided to come here and start a fishing business. He told me how back then, people used to ask if he would take them for a trip around the bay and he realised this would compliment his fishing business. Nobody else was doing this so he found the summer months were very profitable although it wasn’t too long before others starting cashing in on it. His son has taken on the business which he is pleased about. We also chatted about my trips to Scotland and the unspoilt Isle of Islay. My bus arrived so I said farewell and headed back to the car and my journey home. Hopefully, I will be back soon to cover the last couple of walks into Devon from where it will become easier to fit a weekend walking in over the winter months. Fitbit results for today: 18,350 steps, 11.8 miles, 123 ‘floors’ climbed, 3191 cals burned. Born and brought up in West Somerset, I am married to Netta and have 2 children, Poppy and Jim. I work as a caretaker of the local village school which I enjoy. I am always busy! We have a large garden which needs looking after and I am secretary of Old Cleeve and District Gardening Club. I help out as a volunteer on the West Somerset Railway either at Dunster Station or on the Quantock Belle Dining Car. I enjoy walking, photography, cooking, travelling, beaches and coastline, islands, mountains in fact, just being in the great outdoors! I am currently busy fundraising for a charity trek later this year in the Himalayas for St. Margaret's Somerset Hospice. Past charity challenges of mine include a 500 mile cycle ride, a solo parachute jump, a pump trolley push on the local railway, London - Brighton Cycle Ride plus a few other things!